All Is Good With This New Funky Bar In The Hood! You cannot pass by residency road without noticing the new kid on the block ( read Sotally tober) Yes, they have now launched its newest outlet right here, in the heart of the city. The artwork that adorns the front facade is simply colourful, quirky, inviting and most importantly hard to miss! Once inside, the place unravels itself to a mid-century setting with hints of an inebriation. 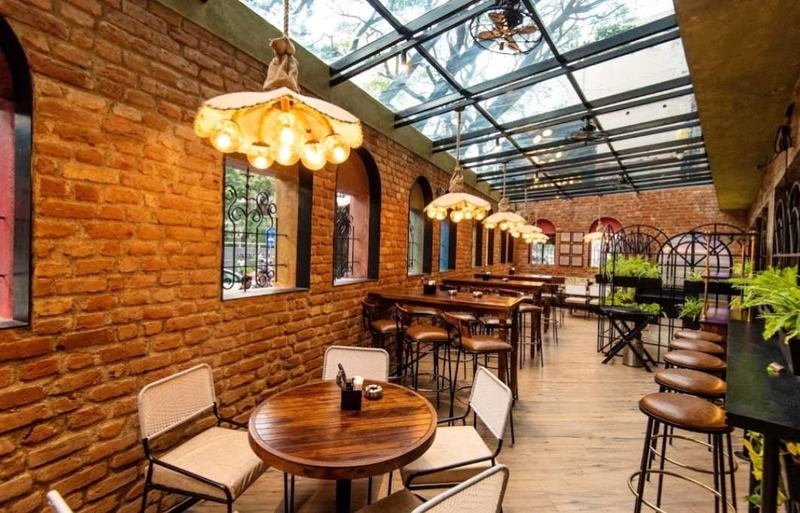 The decor is quirky and eclectic with the suspended lights, custom seating, artwork, walls plastered with pages from the Oxford dictionary, lending a sense of dramatisation to the whole place. Space is divided into three zones, the outdoor area - which is bright and beautiful, exposed brick walls adorned with vaulted windows on one side, potted plants on the other, and a glass ceiling. The semi-open space has peeping windows with hints of green. The indoor space overlooks the entryway and is by the bar, with neon lights and medieval lights, it is the perfect place to drown away your sorrows. The bar has some great mixes which are coconut based and homemade syrups with great concoctions. We tried the Coco Velvet, which is coconut based with a sprinkle of herbs and spices, and was really smooth. Organic Caipiroska, which is organic jaggery with homemade vanilla vodka, which melted down with every sip. Summer's coming, which is a refreshing mix of gin, watermelon and sparkling wine. Wiseman's sour, which gives nice citrus after effect. Their signature mixes are truly amazing and a must try! The food menu has quite an array of options ranging from Italian, continental and Indian. The ones #Soto are the ones to watch out for, they are the melt in the mouth, alcohol-infused bar bites that you just cannot miss. The mushroom on toast, which is stir-fried mushrooms on butter toast sautéed in white wine just cannot be missed. The broccoli and corn cigars are served with spicy mango relish. The corn fritters and Upinakai panner melt in the mouth. The #soto Pork belly, #soto tandoori Jhinga #soto chicken tandoori is all rum infused with Asian spices and go really well with the signature cocktails. For the main course, we tried the spaghetti Aglio E Olio, Chicken Schnitzel which is crumb fried chicken with creamy spaghetti and the Moroccan prawns, which was both colourful and flavorful and a must try. The icing on the cake is the desserts, we tried the #soto carrot halwa with raisins and cashew, with a serving of vanilla ice cream and whiskeyed rabdi which was out of the world. The #soto chocolate mousse was rum infused with dehydrated orange which was so well balanced that we couldn't resist ordering another one. Sotally tober is the perfect place to be for a cheery weekend or to beat away the weekday blues. Their cheery mix of cocktails and heady spin of bar bites are to die for.